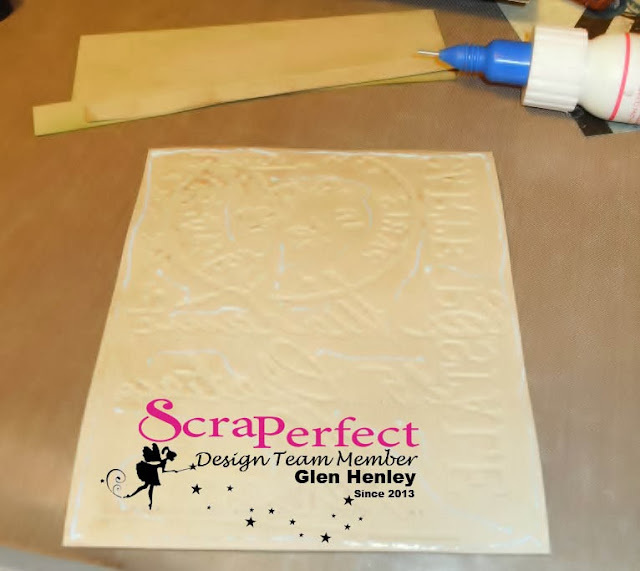 Today I am here to show you how to successfully print on vellum. 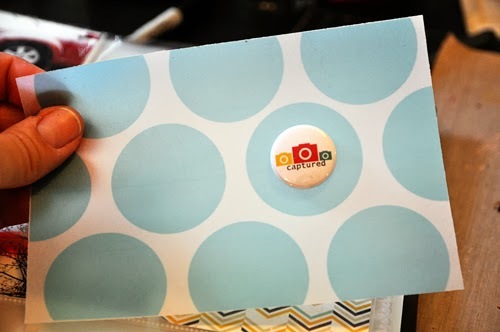 I've recently been converted over to the pocket page, / day in the life/ project life kind of scrapbooking. What really hooked me was all the cool cards and digital kits available. 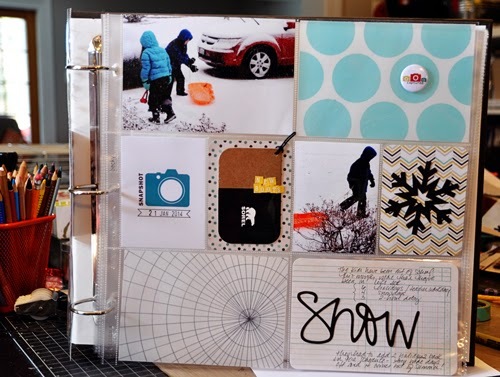 Adding pocket pages into your scrapbook can give you added interest - there's so many different sizes and arrangements. I don't like to limit myself to just 12x12 pages, but instead mix it up. Here's a page a put together with a digital kit. 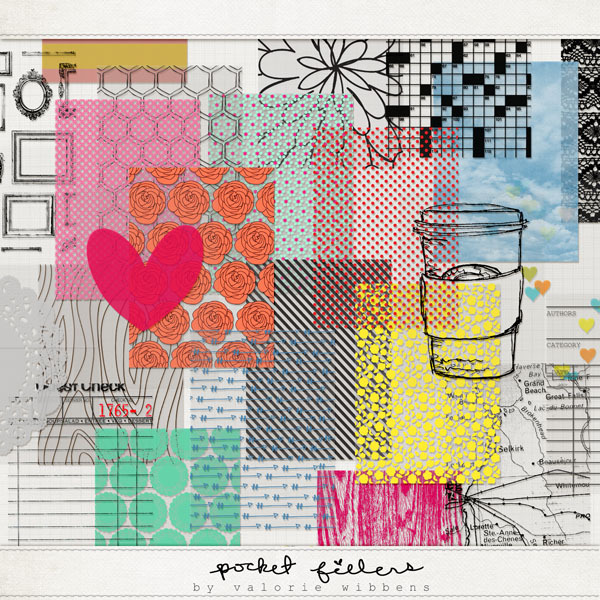 You can find it at the Lilypad - Valorie Wibbens - Pocket Fillers #2. The kit is a collection of png files that you add to other images or print out. As you can see from the preview, the background of these designs are transparent. I really liked the transparency of these cards. I thought they'd be great printed onto vellum, which would allow me to keep a semi-transparent look. After opening the file in Photoshop Elements, I created a new letter-sized file. I then dragged three of the designs onto my file and arranged them so they'd all fit. If you notice I kept them in the middle of the page and not bumped up against an edge - you have less of a chance of getting part of your image cut off that way. Now I'm ready to print. 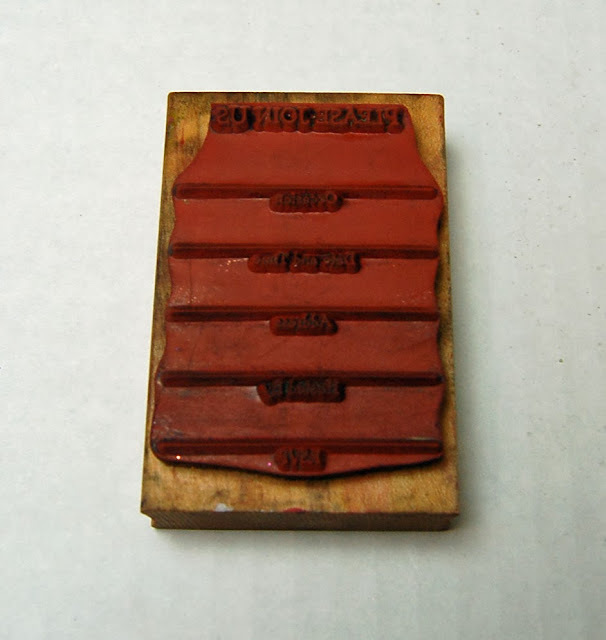 Many printers will let you place vellum in your printer tray. My printer can be tempermental so when I use vellum I have attach it to a feeder sheet. I use a blank piece of printer paper and removable tape. I leave a small bit of space between the feeder sheet and the vellum and run a large strip of tape across the top. Once I've taped my vellum to the feeder sheet I rub the Perfect Crafting Pouch over the vellum. The pouch helps the ink grab onto the vellum and keeps it from smearing. 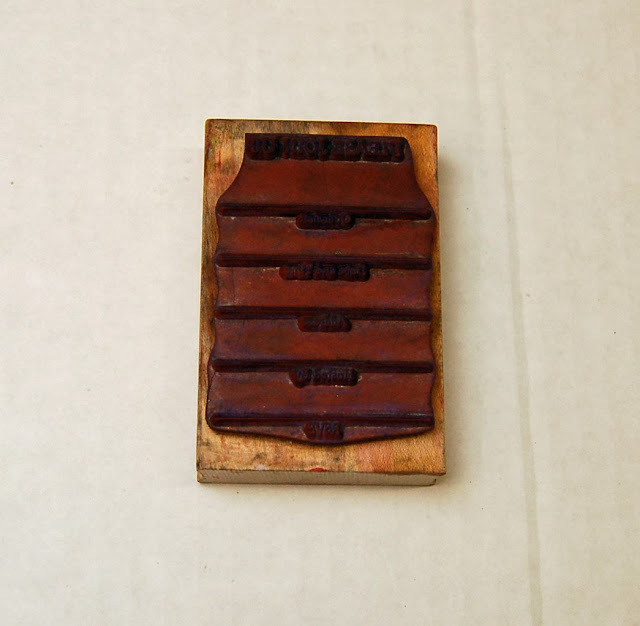 If you use a feeder sheet you need to be aware of where your image will print. The vellum is already slightly lower than the top of the page, and the tape takes up space as well. 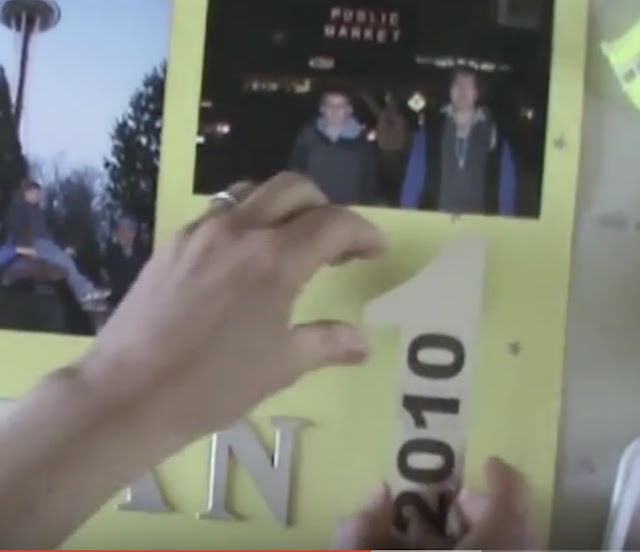 As you can see above, I should have moved the images down slightly, as I got a little bit on the bottom of the tape. 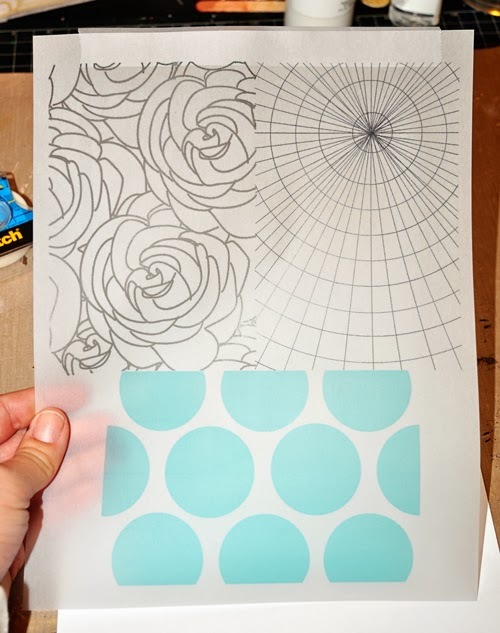 Once it's out of the printer you can cut the designs apart. Now I've got three 4x6 pieces to use in layouts, cards, or other projects. As I put my pocket page together, I grabbed a piece of flair and smeared a bit of the Best Glue Ever on the back and placed it onto one of the circles on the vellum - a quick and easy accent! And I'm finished! Here's another look at the project. It's a bit hard to see the transparency of the vellum without another layout behind it, but you'll have to just try it out for yourself. 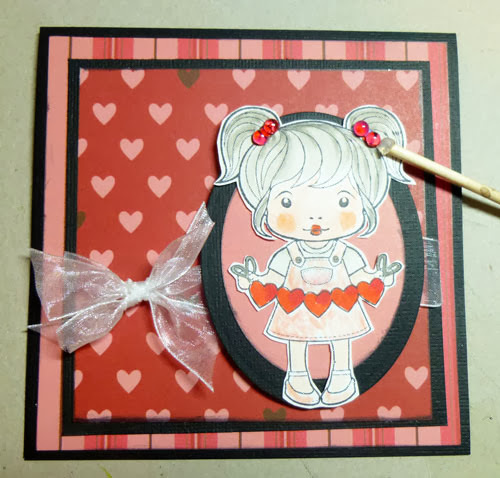 Hello everyone, Marilia Lopes with you again, showing you how to make a Shabby Chic baby girl layout! Who does not love everything that is related to babies?? I am completely in love with them. When I was asked to do this layout-- I was excited! I used many die cuts that I made ​​with the Silhouette. All flowers and Dew Drops were adhered with The Best Glue Ever the ScraPerfect. 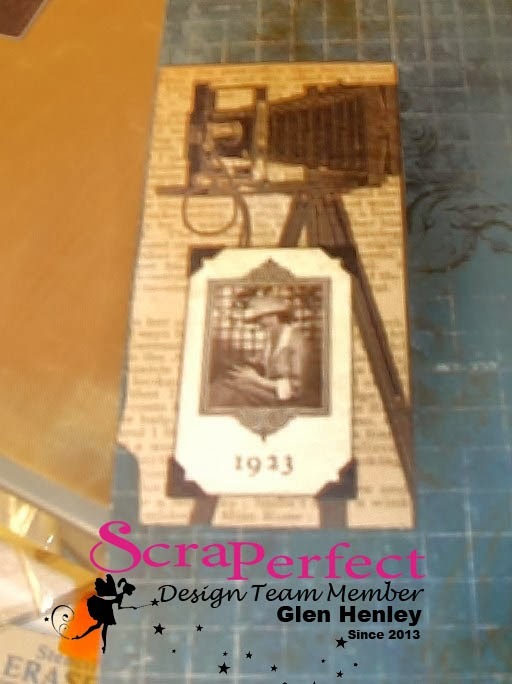 This is Glen here with an exciting new project on how to make a trash to treasure photo box which will take a few posts to get to the reveal but it will be worth it in my opinion. This is the second photo box I'm making, the first being a Christmas box I did before I was a member of this team. Thin line of glue is all you need. I am using the Best Glue Ever to adhere paper elements to my project, having already adhered the large pieces of paper to the lid and sides a long time ago I have the fun now of inking and detailing. Which is also the best part of any project. 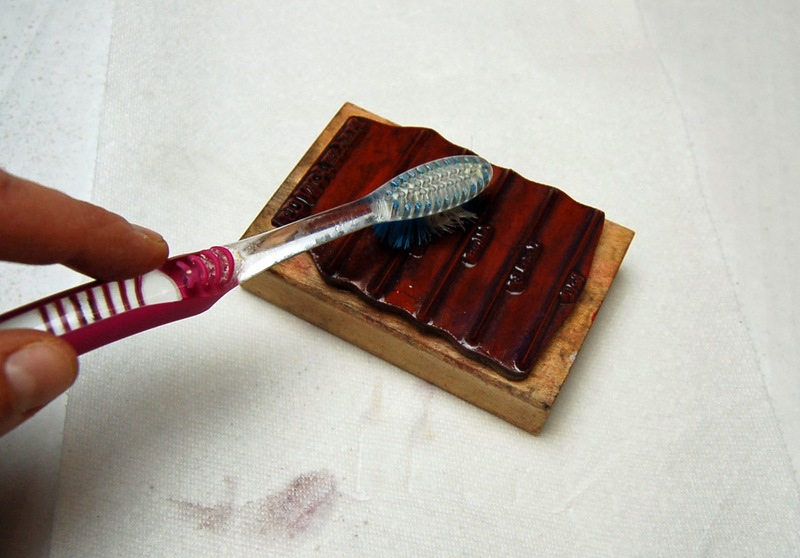 This is another great use for Embellie Gellie! I continue using the Best Glue Ever to add more elements to my box and the No-Clog Writing Cap is the key to great and easy work. Stay tuned for more pics and follow the progress of this project in the coming weeks. Thanks for stopping by and check out the others work on this blog. Hello it's Glen here to show you how to make an embossed French style card. I made using products from ScraPerfect! First I took a piece of card stock that I had embossed previously. It's sometimes good to just spend an evening just using folders and randomly making elements for future use. I ink up a piece of background paper and put it on my card using the Best Glue Ever and then I am ready to place my embossed piece. You can see how I practically draw the glue lines on the paper. 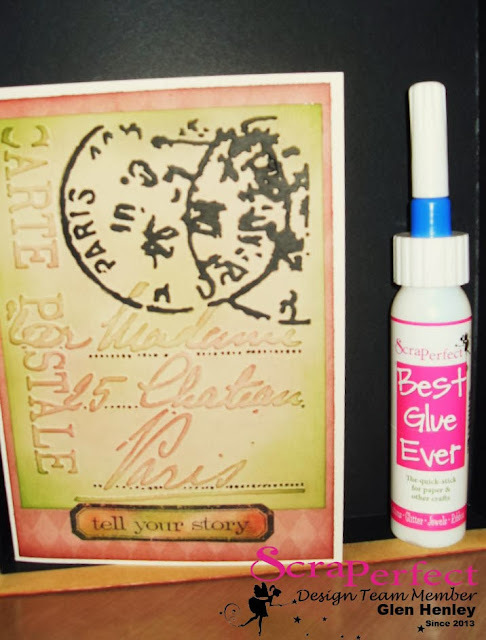 The ease of using Best Glue Ever with the No-Clog Writing Cap cannot be overstated, it allows you to precisely place glue and write with it in a very fine script which is awesome! Here is the finished card which I have hand colored with blending tool and pens to accentuate the embossed details and it's been photographed inside the lid of my other project, a nice photo storage box that will appear in my next post! Thanks for reading and be sure to check out the other posts on this blog for great work and inspiration. 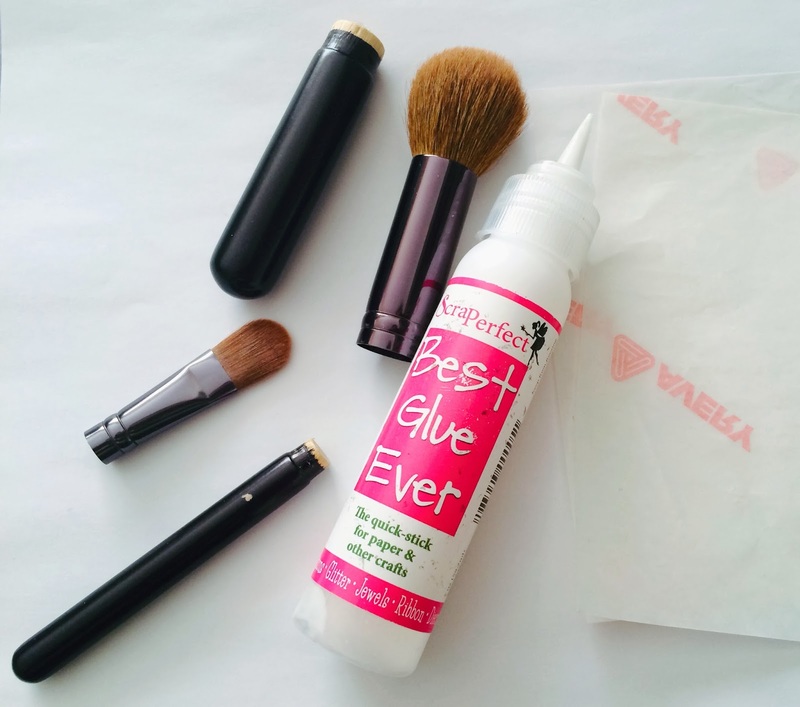 Hello Chelsea here to share the best way to repair your make-up brushes using the Best Glue Ever. 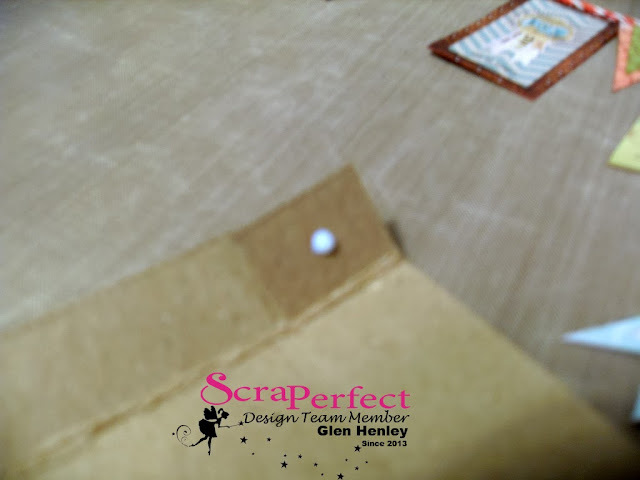 Michelle shared with us last week how she used the Best Glue Ever to fix her Christmas ornament which you can find here. The Best Glue Ever is truly that, a glue that we can use for many different projects or fixes. The project we do not recommend using Best Glue Ever is on glass. Can you believe that the BGE is strong enough to fix plastic, wood and metal objects? 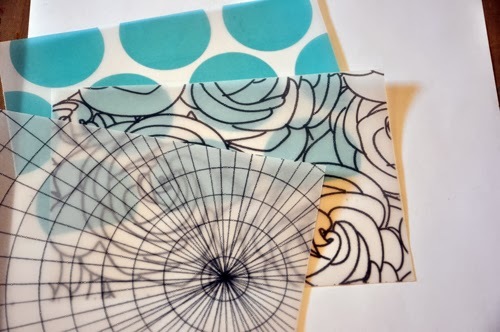 Let alone it is gentle enough on paper projects that it does not bubble, or wrinkle your paper? Amazing if you ask me!!! 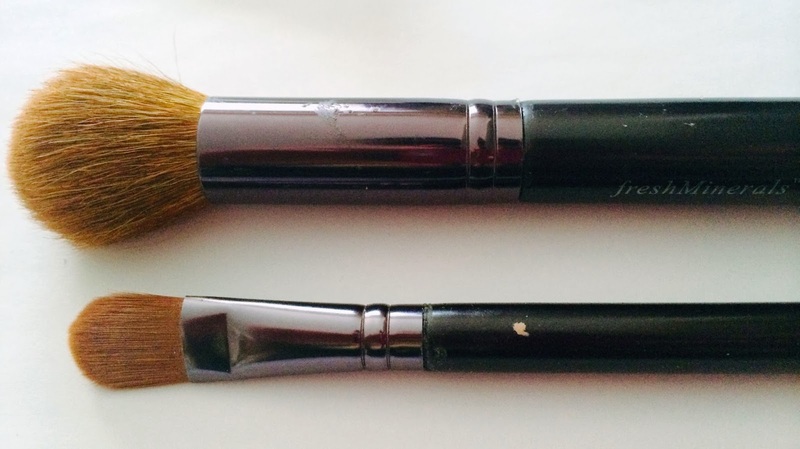 Today I like to share a fix that I did with my FAVORITE make-up brushes in which I was disappointed broke on me. Though I had the Best Glue Ever to the rescue! 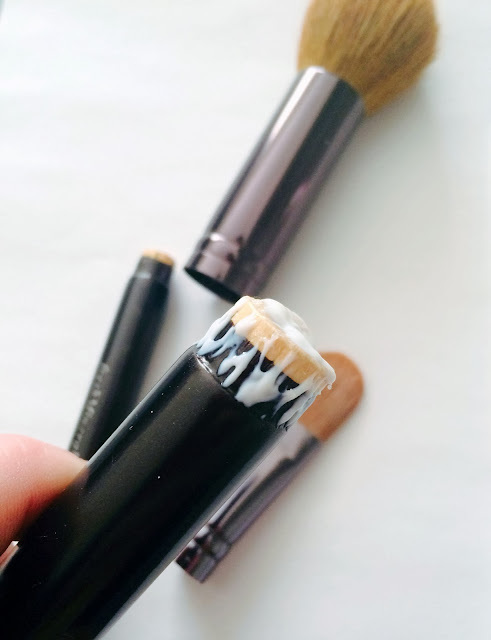 First, apply a layer of Best Glue Ever around the edge and top of the handle. 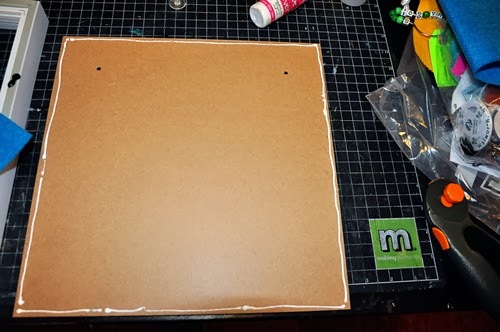 Using your release paper, place your glued handles to dry. The release paper allows the glue not to stick to anything and will peel off once dried to clear. Let this dry to CLEAR. This is very important that you let this dry as the Best Glue Ever works best when its clear and tacky vs white and wet. Here are some progress images from the time I put it on, appox 5 minutes later (you will see in the second photo how some areas still have some white glue) to the clear and tacky stage. In total I waited appox. 8 minutes for this to totally dry clear. Wasn't that easy? In 10-12 minutes your object is fully fixed!! What about you ScraPerfect fans, what have you fixed with the Best Glue Ever? Leave us a comment letting us know what you have used with the BGE, we would love to hear! 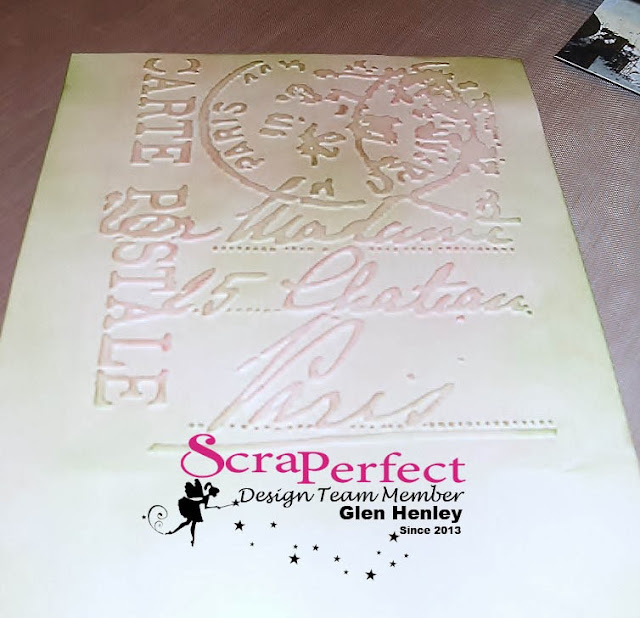 Hey ScraPerfect fans Michelle here to show you the best way to remove dried ink from your stamps. 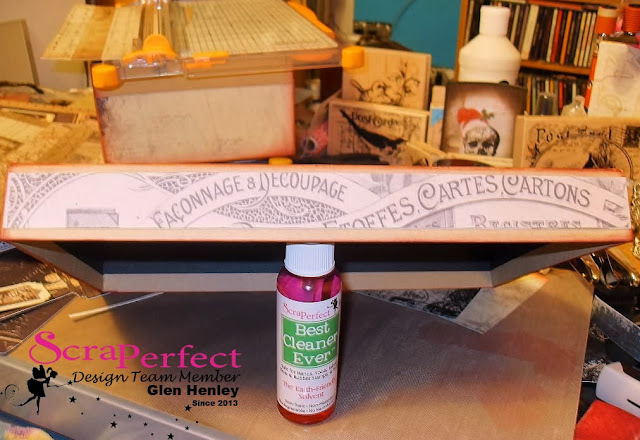 It is easy to clean a rubber stamp using the Best Cleaner Ever! This stamp was used when I purchased from a store going out of business. I've only used it a couple times and it looked like this when I bought it several years ago. For this stamp I sprayed a generous about of the Best Cleaner Ever over the stamp. Rub the cleaner in to get a good coverage and help loosen the dirt. 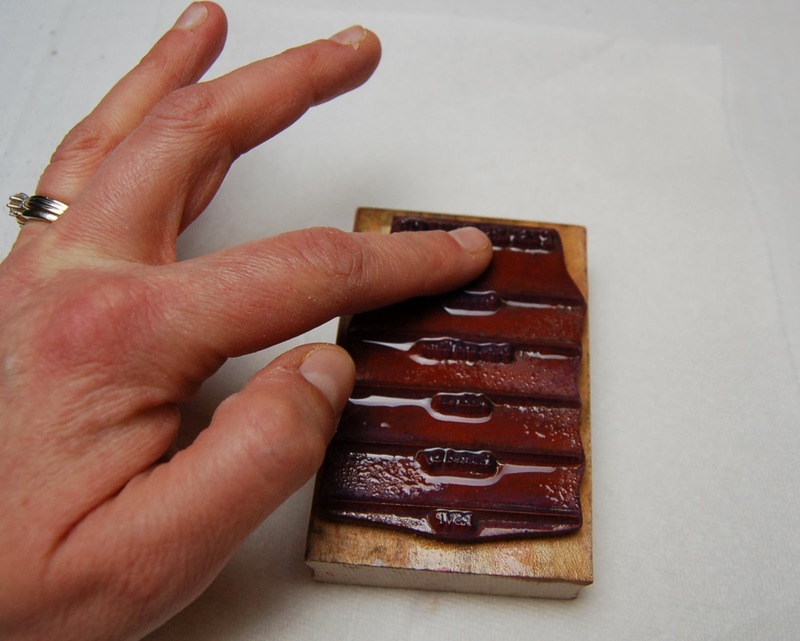 Then I lightly scrubbed with an old toothbrush to help get inside side the small letters. Let the Best Cleaner Ever set for a few minutes then rinse with water. Here's the results after the first cleaning. I followed up with a second spray of cleaner and gently used a toothpick to really get in between the letters. 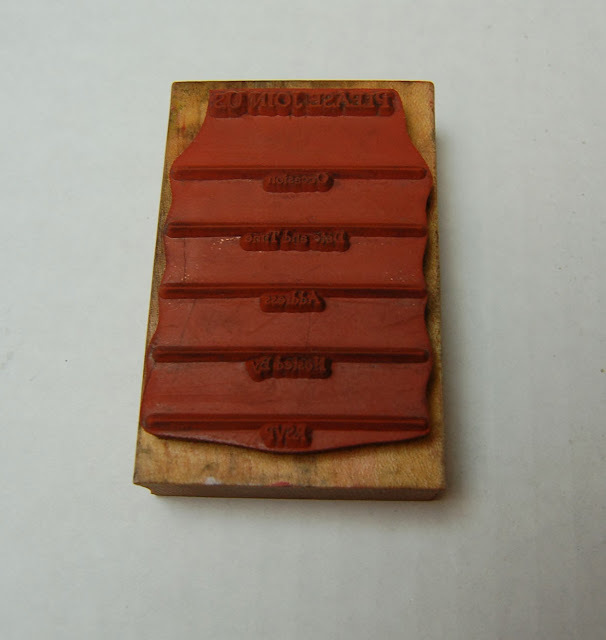 Look how clean this old dirty stamp looks after a little Best Cleaner Ever. 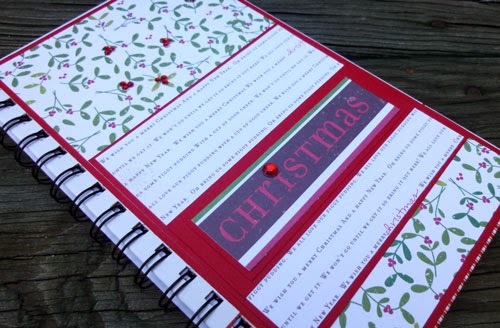 Tips on How to Make a Beautiful Christmas Journal. 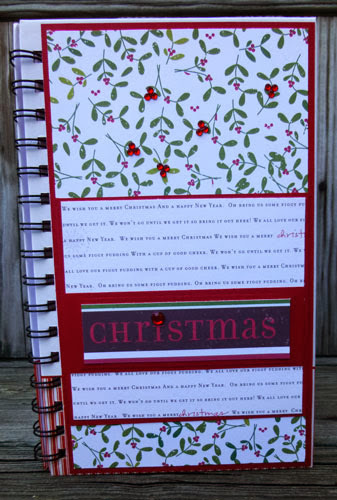 Good morning ScraPerfect friends, Steph here today to show you tips on how to make a beautiful Christmas journal. The Best Glue Ever was the perfect adhesive to use in adding bling to a journal. I picked up several clearanced spiral bound notebooks figuring I would be able to use them for a variety of future projects. Since I still had some Christmas papers close at hand, I added some cardstock to the front of the notebook and put layers of pattern paper on top. The pattern paper, consisting of holly and berries, needed some bling, so I used the Best Glue Ever and the Embellie Gellie to add gems to the berries. You just add a little bit of the Embellie Gellie adhesive to the flat end of the stick and then use the stick to pick up any gem you are looking for. Since the gems cling to the adhesive, it was quite easy to then place the gems directly where I wanted them. A dab of the Best Glue Ever and the gems are permanent on my journal. This was a quick and easy project as well as fun to make. All I need now is add photos and journaling and I have the perfect Christmas journal. Cute card! Check out the little pigtail holders! And what's perfect for picking up and placing tiny Dew Drops??? Embellie Gellie™ of course! 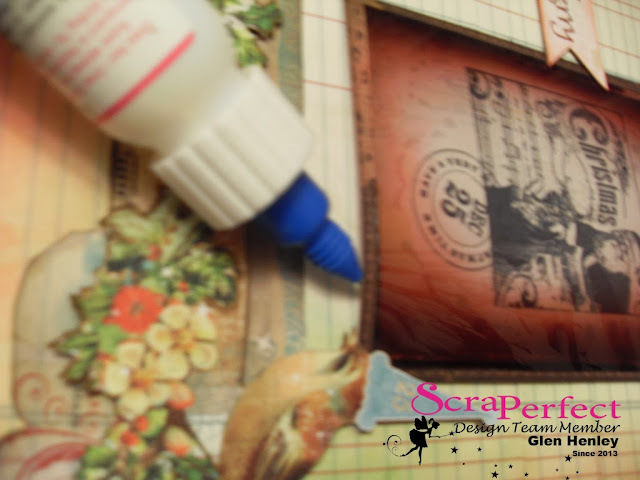 Hi all Amy here with a few "teachable moments" on this New Year's Layout that apply to ANY layout or card. 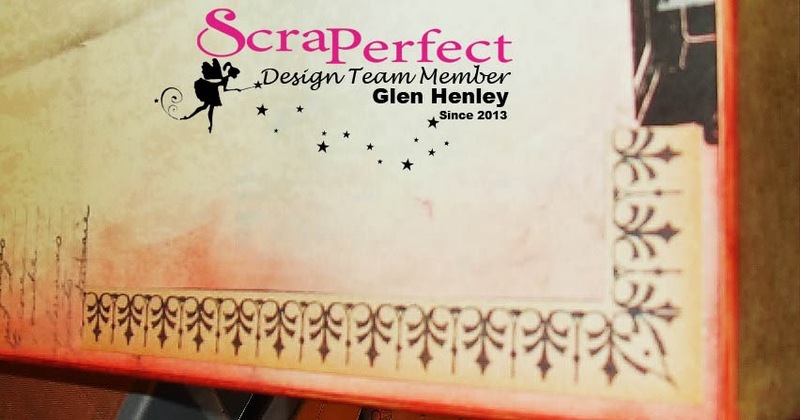 Highlights include: How to perfectly print on metallic paper, how to inkjet print on chipboard shapes, how to use text boxes for doing your journaling, and ...more hidden "gems". 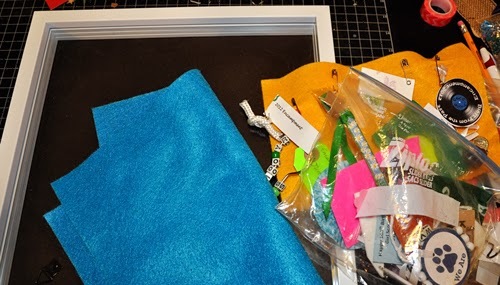 Deborah here showing you how to make a great shadow box for your child's room. Like most kids, mine like to hoard lots of little treasures. If it's my son, they're piled all over his dresser. My daughter's end up scattered all over her room - under the bed, behind a dresser and piled on her desk. 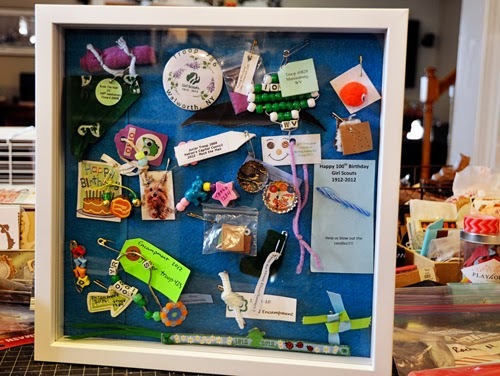 When she cleaned up her room over Christmas break she found a few bags of Girl Scout swaps. 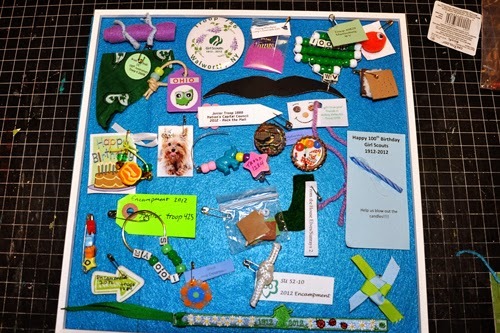 Swaps are little pins that are handmade and traded at Girl Scout events. Many of these were from the 100th anniversary event in Washington, DC a couple of years ago. But why keep something like that in a bag (that will end up under the bed again)? Why not display it on the wall? 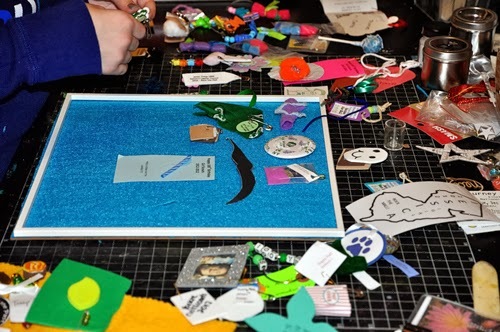 I started with a shadowbox from a local craft store and several pieces of felt. 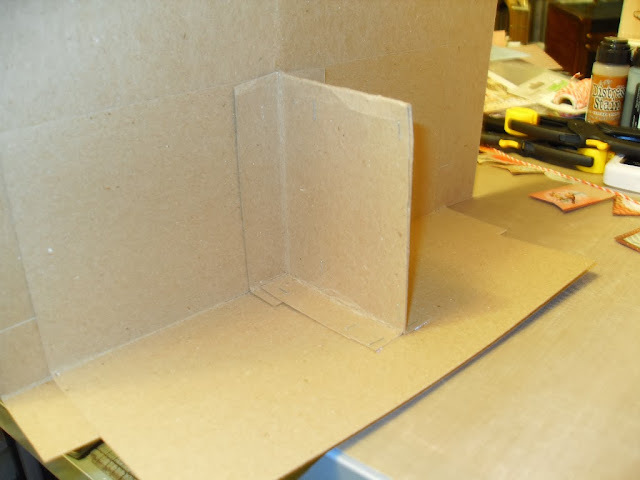 This is around 12" square, and the back was just a hard chipboard. I chose felt because we would be pinning many of these to the back. The felt was a bit longer than the back but not wide enough to cover it. I loosely measured where the edge would hit so I could apply the Best Glue Ever. 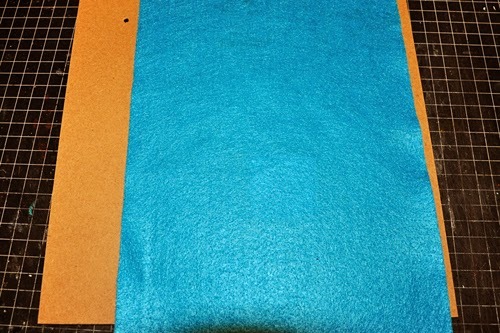 I ran a thick line around the edges, plus up the inside where the felt would overlap. Then I used my finger to smear the glue around. I didn't want to cover the entire back because I wanted to be able to pin as many swaps as I could onto the felt. 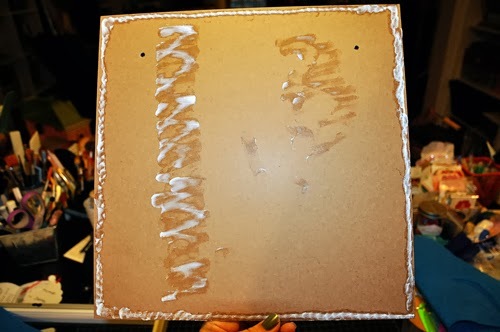 Here's how the back looked after spreading the glue (and wiping my finger off onto the back). Next up was lining up the felt onto the back and pressing down to get a good hold. And I let my daughter try out my rotary cutter for trimming the edges. This was pretty easy as we flipped the back over and used the edges as a guide for trimming. ** Tip: if you're making a back for a shadowbox, test out the backing material before cutting and adhering to make sure your box will close. If I had used something thicker than the felt I would not have been able to glue it to the outside edge. After the background was set, my daughter got to the fun part -- arranging all the swaps. The shadowbox had a set of inner "frames" so we put one on the back to use as a guide in placing the swaps. She was quite deliberate about arranging the swaps. My plan was to cram ALL of them onto the back, but she had other ideas. Once she was happy with her arrangement, I could start pinning and adhering them to the felt. After I was finished, I cleaned the glass and put the box together. She's very happy with her new wall decor. And this could easily be used with any small toy or memento. 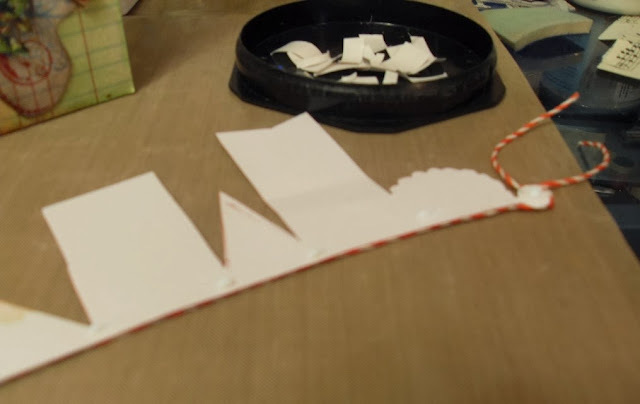 Change out the felt for a solid piece of cardstock or pretty paper. 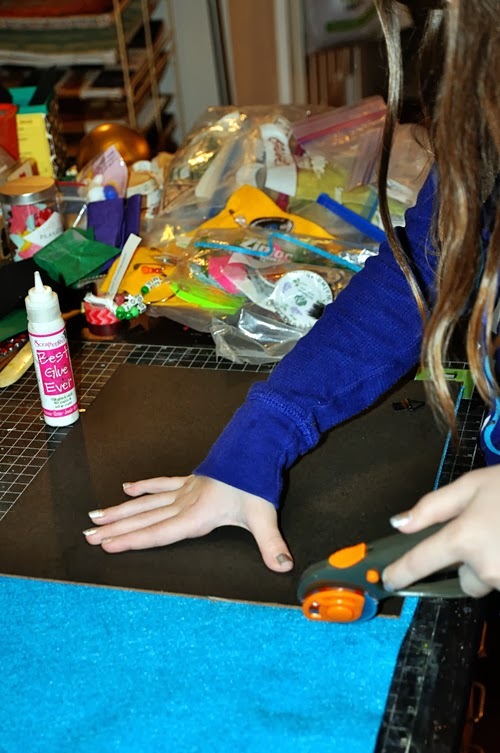 Layer the back of a box with school programs or wrapping paper. The possibilities are really endless. 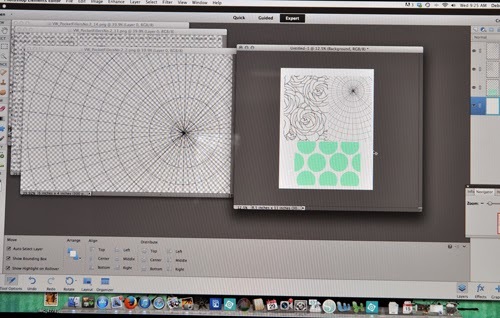 Hi Everyone Marilia Lopes here showing you how to make your own charger plates. In January vacation is very difficult to concentrate and do a layout. The house is full of friends of my children and they call me all day. So in the month of vacation I love to do altereds. Today I bring to you a show sousplat in MDF covered with jute and decorated with Dew Drops Dew Drops and Diamonds Shapes all glued together with The Best Glue Ever the Scraperfect. 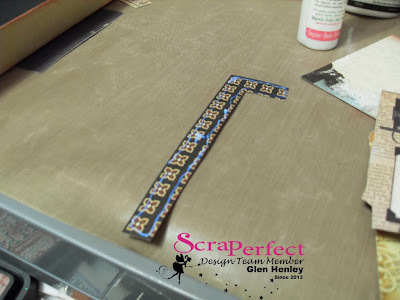 Very simple and fun to do, you assemble the pattern in your mind and will gluing. 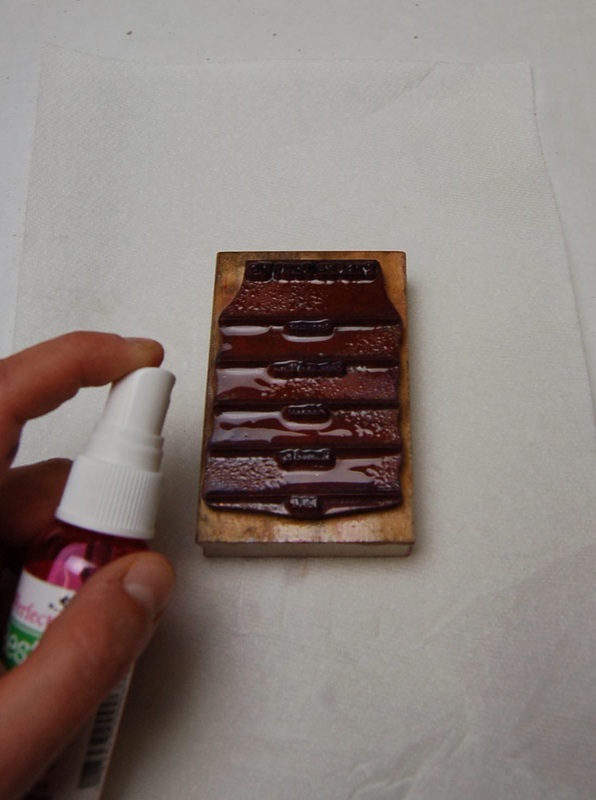 The Best Glue Ever is very economical and easy to use. Thanks so much for stopping and view my work! Hello everyone Glen here today showing you how to make this beautiful Altered Art Christmas Decoration. The Best Glue Ever, the No-Clog Writing Tip and the Perfect Crafting Pouch are the stars of this show! 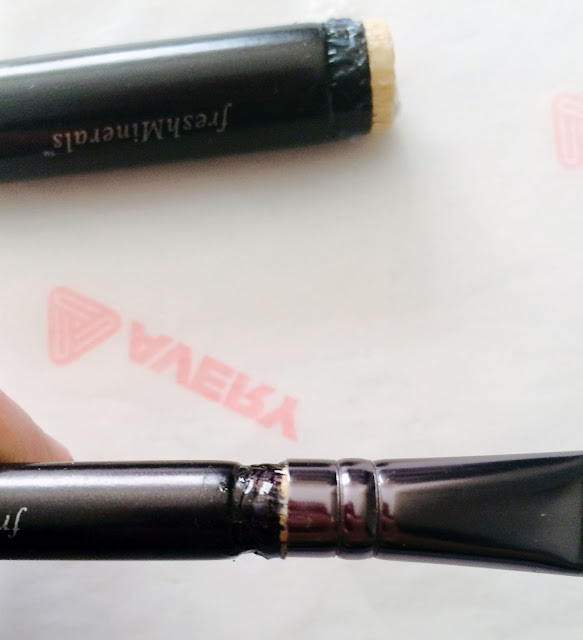 on the Best Glue Ever makes this precise glue placement possible!